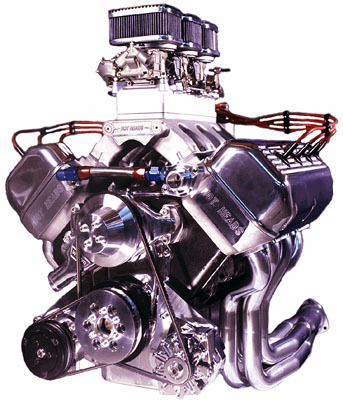 Perhaps the most famous factory induction of all time is Mopar's fabled 6 Pack intake offered between 1969 and 1972. We've designed this carb adapter to mount three Holley 2bbl carbs to the top of any 6-71 or 8-71 supercharger, or to our own Chrysler Tunnel Ram intake manifold. Unlike most 3 x 2 intake manifolds, Chrysler's intakes didn't space the three Holley 2bbl carbs evenly apart. 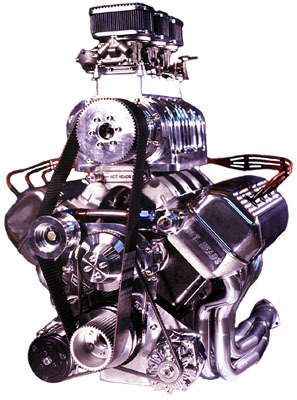 We designed our carb adapter with the same spacing and bolt pattern as the factory Chrysler 340-6 and 440-6 intakes to accept the original style Holley Six Pack carbs, factory fuel lines and throttle linkage, all of which are currently available from Hot Heads. This also allows use of factory Mopar 6 Pack air cleaner assemblies, or individual finned aluminum air cleaners which we also carry.